Leopard conservation in the Caucasus was the subject of a meeting of international experts in October. Barbara Siebert, Program Director of the Foundation for the Preservation of Wildlife and Cultural Assets (FPWC), sent this report. FPWC is World Land Trust’s (WLT) conservation partner in Armenia and the workshop provided FPWC, for the first time, with an opportunity to present the Caucasus Wildlife Refuge project to a panel of international experts. The forum also enabled FPWC representatives to discuss ways to integrate FPWC’s work into the broader regional strategy for leopard conservation. During the meeting participants presented working papers focusing on the status of leopard in their respective countries. In addition, representatives from WWF Russia outlined their breeding and reintroduction programme for Caucasian Leopard in Sochi National Park. 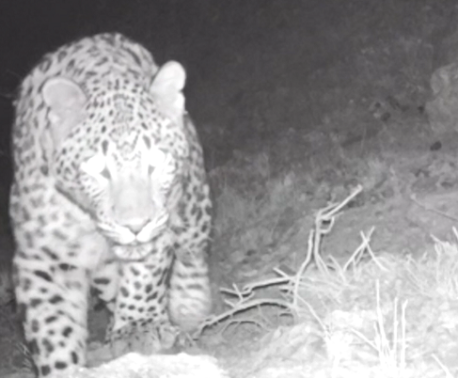 A Caucasian Leopard in the Caucasus Wildlife Refuge: camera-trap image recorded 8 November 2013. © FPWC. Though there are confirmed leopard sightings in various Caucasian countries including Armenia, the largest population is in Iran. The experts agreed that the existence of a healthy reproductive population of leopards is in doubt, which makes conservation efforts all the more urgent. With only a few individuals recorded, the future of the Caucasian Leopard in the wild is a major cause of concern. Habitat destruction and fragmentation as well as poaching are common risks for these animals throughout their range which spans six countries in the Caucasus. Both the land secured through WLT donations to extend the Caucasus Wildlife Refuge, and the wildlife rangers supported by WLT’s Keepers of the Wild programme, mitigate hunting in this region but nonetheless the largest of the leopard species needs protection throughout its range. Only an immediate and concerted effort from scientists, NGOs and governments will offer the majestic Caucasian Leopard the big spaces and protected cross-border corridors that are crucial for the survival of this rare species. 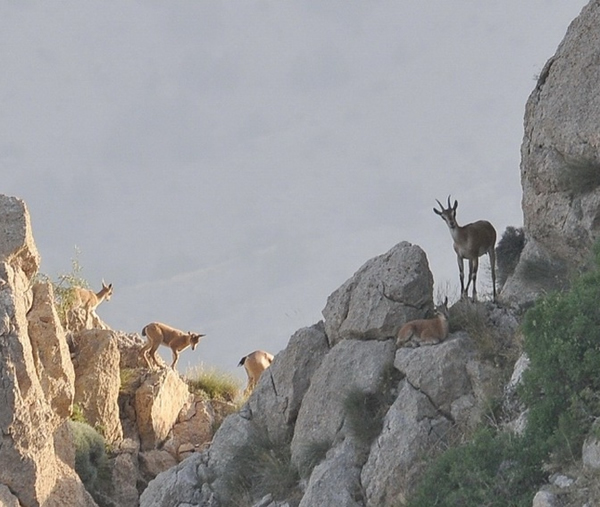 FPWC joined the experts’ group for the first time as a result of the success of the Caucasus Wildlife Refuge (CWR), which was created in Armenia in 2010 with funding from IUCN National Committee of the Netherlands. The CWR forms a buffer zone for the Khosrov State Reserve and is the first private conservation area in the entire Caucasus region. The CWR’s deep gorges and rocky mountain steppes provide an ideal leopard habitat. The Caucasian Leopard is resilient and with increased habitat protection, and anti-poaching measures, it can survive in the wild. Other positive news for the Caucasian Leopard is that, through constant monitoring and additional protection, numbers of the rare Bezoar Goat, the leopard’s most important prey, have increased dramatically in the region. FPWC’s rangers have increased the number of Bezoar Ibex in the area by reducing hunting, this increase in prey is critical to the survival of Caucasian Leopard. © FPWC. 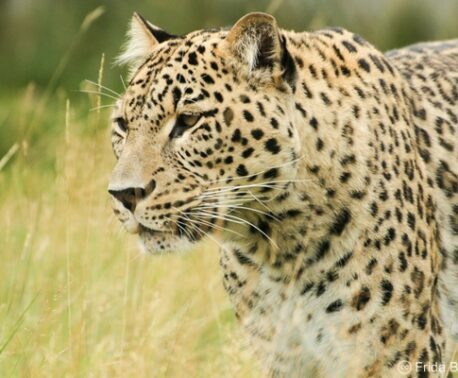 In 2012 FPWC experts detected the first signs of a leopard in the area and in 2013 camera-trap recordings proved that a male Caucasian Leopard had chosen FPWC’s Caucasus Wildlife Refuge as its hunting ground. With funding from WLT’s special appeal to save the Caucasian Leopard, FPWC experts are currently collecting data on the species in Armenia, implementing anti-leopard poaching measures and raising public awareness of the urgent need to protect this key species in their country. The workshop took place on 10/11 October 2014. It was organised by the IUCN Cat Specialist Group, WWF and the Council of Europe’s Bern Convention as a follow up to a similar event that had taken place in Tbilisi in 2011. Manuk Manukyan, FPWC Conservation Coordinator and a WLT Keeper of the Wild, and Barbara Siebert, FPWC Program Director, were among the delegates. The recommendations and findings of the regular experts’ meetings are intended to serve as a basis of regional, as well as national, conservation plans for the endangered Caucasian Leopard (Panthera pardus saxicolor) in all Caucasian countries – Armenia, Georgia, Azerbaijan, Turkey, Iran and Russia. As this report demonstrates, time is running out for big cats in the wild. Species such as Caucasian Leopard are at risk. In its 25th Anniversary year WLT is putting the spotlight on big cats with a major appeal to raise funds for big cat conservation. Outside conservation areas, big cats are severely threatened by loss of habitat, human-wildlife conflict and hunting. To survive, big cats need more wildlife corridors, larger reserves and greater protection.